The Cat's Eye High Jewelry uniquely combines two of the most refined techniques in gem cutting and gem setting: the first is the "invisible setting", a truly exceptional skill that is the domain of only the most experienced Masters; the second is the "snow setting" in which the natural aspect achieved requires diamonds of varying sizes and weights. Any light that reaches it is amplified. 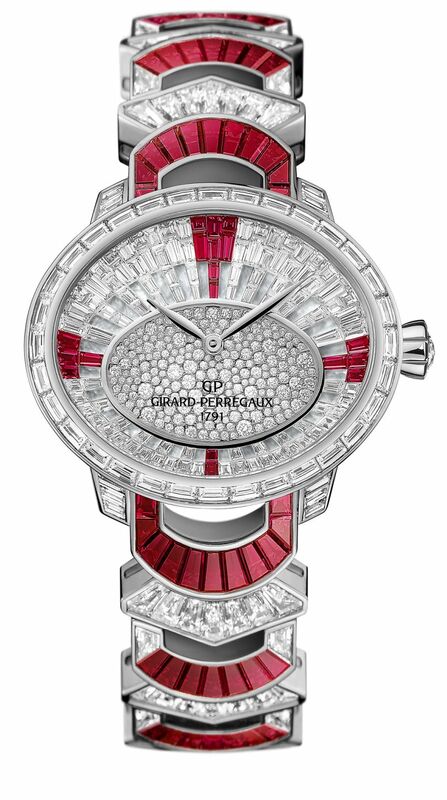 Creating this masterpiece demanded no fewer than 316 diamonds and 94 blue sapphires or rubies. 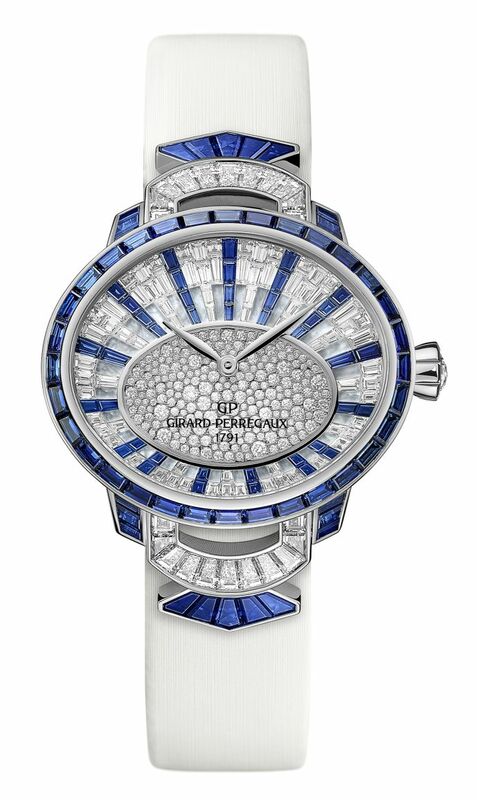 The precious and exceptional character of this timekeeper is further enhanced by the case set with 23 baguette diamonds and 54 blue sapphires or rubies that reach till the lugs, creating contours that also beckon the sense of touch. 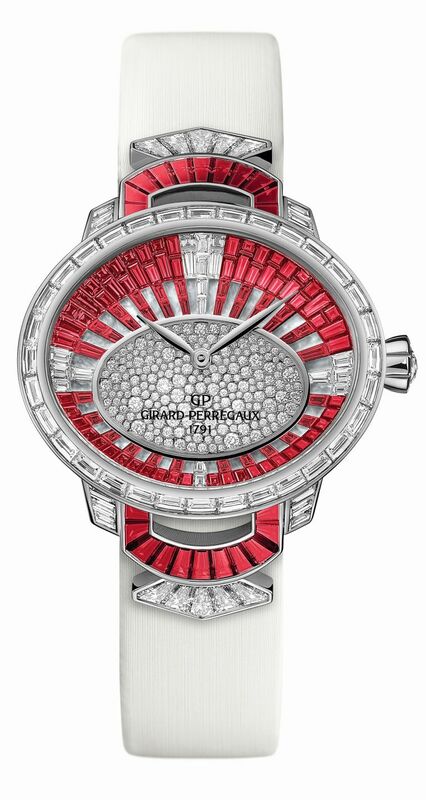 At its center, a sumptuously paved dial where every single one of the precious stones 286 diamonds of varying cuts (totalling 2.05 carats) and 40 baguette sapphires or rubies command the highest level of artisanal artistry. Once it has passed muster, each stone is individually shaped into its assigned cut: baguette, trapeze, brilliant. class of Haute Joaillerie watches that come in multiple variations, each one uniquely entrancing as it is created bespoke to meet the particular expectations of a most discerning clientele in search of the ultimate in exclusivity. The case, in 18kt white gold, measures 36mm x 31mm. 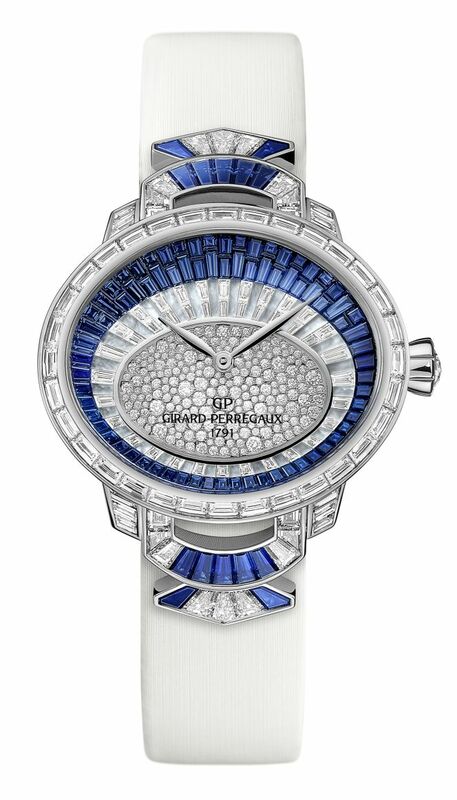 It is set with 23 diamonds (1.7 carats) and 54 blue sapphires (or rubies) (3.95 carats). It has an AR-coated sapphire crystal, a sapphire display back, and it is water resistant to 30 meters. Movement is the Swiss automatic Girard-Perregaux in-house caliber GP03300 with 27 jewels, 28,800 vph and a power reserve of 46 hours. Functions are: hours and minutes. It comes on a white calf leather strap with satin effect, and a gold folding clasp set with 7 diamonds (0.55 carat).